Kev, even now the 'scrutiny' being applied to this record attempt bears no comparison to say a track world record. If Bekele had stepped onto the infield for a second, even one stride, back in 2005 his record would have been over. Thousands of people watched every stride from the stadium, loads of officials, electronic timing precise to 0.01s. Go to youtube and you can watch THE ENTIRE RACE (its in two parts)! Now contrast that with what Robert Young is offering (and maybe previous attempts too, not singling him out here). All we have had so far in the US is a tracker which even now I'm confused whether it was on the van or the runner or a mixture of the two, and some summary only GPS logs,Guiness who will authenticate it for record purposes are not present. That's like those officials at Brussels only coming into the stadium after Bekele had finished! So in summary I don't think Rob has anything to complain about. I think he has been a bit naiive, everything is live on the net these days or people will ask questions. OK streaming the whole thing live might have been a stretch but doable I would say? And failing that, regular daily uploads to a mapping site like Strava is a minimal requirement. Charlatans and confidence men are not a new phenomena. A lot of crazy hoaxters who come across very passionate and sincere about what they are peddling. There are some pretty great stories about breatharians, for example. Also some really terrible examples - Jim Jones. Sorry Kev, but you appear to be either in on it or one of the gullible true believers. Not sure which is worse. Some guy starts stalking you at 2 AM in the middle of nowhere. Said guy then (of course!) dashes straight home to trash you on Letsrun, the recognized world leader in angry little minds. Coachkev if you believe his desert run claims are very possible, I'd like to hire you as a coach. I'm looking to run a 24:30 10k and could use some of the knowledge you possess. Looks like Rob and his crew have a well deserved rest at the Main Street diner in Saint Peters, Missouri. Currently looking for 1 dishwasher's and cleenup personel and weekend cook . Call for more information or apply within. I agree with you and I think Rob should and could have done a lot better with the reporting. I have sent a message to his team and will let you all know the outcome. 23:54 and 31:52. Looks like said interview occurred between 35-40k. Half was reached in 1:22:18. The 10k between 25-35k was done in basically 47 minutes, so he was slowing down. I could see him doing a 2:50 or so without the interview stop, but not a evenly split 2:44 or a negative split of 2:41. That aside, he has the technology to put all this doubt about his current endeavor aside, but doesn't. He should crank out some 30-40 mile segments at sub 7:00 per mile pace to show that the past data claiming that type of pace was legit. Missouri is the "show me" state. As a scientist and decent runner, I'm telling you to hold off on that. Leiberman is probably really good at what he does: evolutionary biology, and measure impact force in runners with different footstrikes. Whether he knows jack about elite and sub elite running is a totally different question. Along with whether or not his measurements have any carryover to performance predictions for 5K, marathons, etc. They probably don't. Just like you have probably seen plenty of runners and been like "oh he has good form, light on his feet", but then you find out the guy runs 20min 5Ks. For all we know Rob and Kipsang have the same impact force (normalized to body weight) on their feet when running. Great, a nice light footstrike. But that is 1 out of a million factors that goes into making you a world class marathoner vs a hobbyjogger. That was wrongly reported earlier on this thread, and then corrected within a page or two. The alleged PRs for full and half marathon as 2:41 and 1:08 are still on his website by clicking the red/white down arrow at the top of the page. There is no documentation for either. They are major outliers for any verified race that Rob Young has run. There has yet to be found any data supporting the claim for either. Where in the midst of his 5K splits for his 3:07 at London 2015 did this alleged 15-20 minute interview occur? 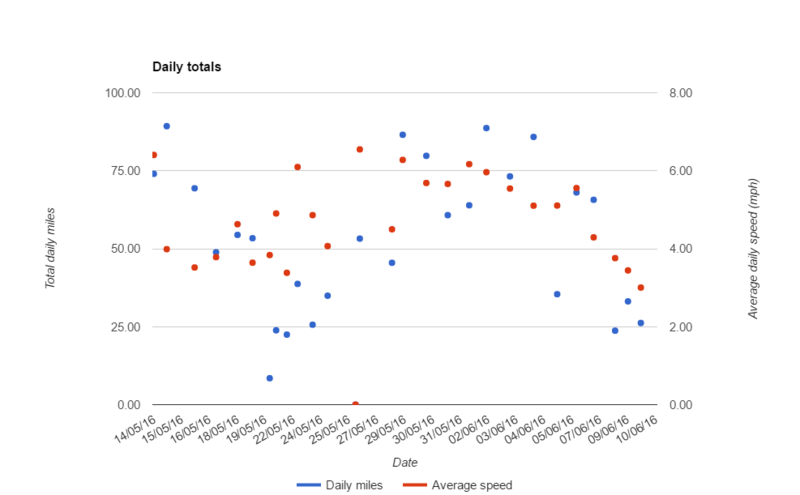 Note the sudden decline in both speed and distance after this thread was started (7th June). Now that would be genius. Create this whole thing so people start paying attention to your run. My god that would be amazing. Complete breakdown by an independent financial analyst not linked to any of the parties involved of the money donated for charities, verification of how that is used. As some of us predicted. For now he's going to try to run it "more seriously". PR-wise it's the best move as he can claim the heat/other issues made him throw in the towel. If he were to suddenly pull out it might look suspicious to the fanatics. However, he's underestimating the effect that dragging this out will have. He is more exposed with ever my passing minute. I personally find it amusing that they are likely scrambling to get him to run as many miles as possible while cheating as much as possible. I do agree this is very emotionally and physically demanding. Then again, isn't he running at night when it's not that hot and doesn't he have the experience, toughness and talent to eat 5:00/pace for bfast? Or did he run out of espresso? Man Ultralist sounds like the WORST. RE: Robert Young fakes run across America 6/11/2016 12:56PM - in reply to Film at 11:00? Those splits should be 17'31, 19'00, 19'49, 21'28, 21'32, 23'08, 23'54, 31'52, then 9'26 for the final 2.2km section. Remember the third mile is very quick, and so the first 5k cannot count as a pb (nor the first 10km). There is no way his 8th 5k was going to be sub 15 so I don't know why you think he would have been capable of 2:50? They started with the friendly "he should have shown himself and we'd have been happy to hang with him" along with threats on Facebook of legal action against him and the board (see page 2 or 3 of this thread). Then a couple days later they thought up the knife-wielding lunatic scenario. They were so traumatized by the night-stalker that they didn't mention anything about it on their blog after it happened.